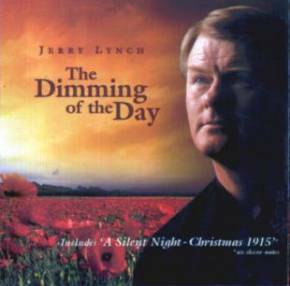 The Dimming of the Day was originally issued by the Dolphin label in 1998 and built upon the success of Jerry’s debut single, A Silent Night (Christmas 1915), which referred to the Yuletide truce resulting contact between opposing troops during a brief respite from trench warfare. Both the single and album garnered recognition for Jerry’s exquisite tenor voice and sensitive interpretation of a broad range of traditional, classic and contemporary songs. Jerry comes from Kilfenora and his brother John is currently leader of its céilí band, but apart from a background in traditional music, he has also taken part in stage musicals and been a finalist in several popular song competitions. In addition, he has sung in Ennis Cathedral, appeared on the Céilí House radio programme, made several television appearances and sang with the Kilfenora at the 2003 Lisdoonvarna festival (the one that was held in Dublin!). Anyone seeking vocal similarities would instantly be reminded of Tommy Fleming, especially since Jerry also sings Stephen Foster’s Hard Times. However, he remains very much his own man and his qualities have certainly been captured by P.J. Curtis’s typically astute production. It also helps when the accompanists include musicians of the calibre of Josephine Marsh, Claire Keville, Liam Lewis and Pádraig O’Broin, to mention just four of the crop on show. Jerry’s choice of material is certainly eclectic too and ranges from a psalm, A Íosa, via My Lagan Love, folk songs from the 1960s, songs from the shows, and Mona Lisa (forever associated with Nat King Cole) to pieces from Richard Thompson and Mark Knopfler. The resulting collection might not be to everyone’s taste, but few will fail to recognize the implicit emotive strengths of Jerry’s voice nor the subtlety of his singing. The album is distributed in the UK by Copperplate.